ROTFL! I must admit that I used to have the same problem, and now with the Mom's house/Dad's house split, it seems that when I need it, the deluge is over...Murphy's Law. Is that white wine vinegar I see in that group? Time to clean the microwave. Unless you don't have one and then no. 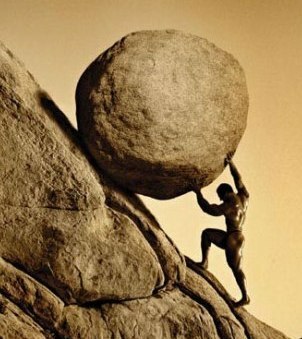 So much of parenting is Sisyphean. It's one of my favorite descriptors. Nothing is ever....just.....DONE. Is that a restaurant-sized container of garlic salt? His and her bottles of cooking wine? Perhaps Chock Full o'Nuts left the stores years ago and only existed in her pantry? Salvation Army is your friend. Throw your crap in their containers and be glad to be rid of it while knowing you are helping others...and freeing up valuable seating. I'm with Alaina. Surely a local food pantry can use some condiments, and every time I clean out the kids closets I make a trip to Goodwill. Vinegar makes your bathroom and kitchen fixtures shiny. It also takes the smell out of musty washing machines and clothes that went into the bottom of the hamper all wet and stayed there for 2 days. (Why yes, I do have boys!) I've recently bought a new gallon jug of vinegar. Chock Full o' Nuts has upgraded to "better coffee a BILLIONAIRE's money can't buy." Why settle for mere millionaires?